My comment is a grammatical question. In the prayer: “Inspired by this confidence, we fly unto thee, O Virgin of virgins, my mother; to thee do we come, before thee we stand, sinful and sorrowful. O Mother of the Word Incarnate, despise not our petitions, but in thy mercy, hear and answer us.” the speaker is always first person plural, EXCEPT ‘my mother’. If this prayer is to be consistent, shouldn’t this be changed to ‘our mother’ for consistency? Or, make the entire prayer singular, instead of plural? Please accept my prayers for the past 5 years for my son. To be able to apply to med schools and be blessed with all that is needed for doing this and a seat in a good med school to do medicine and become a medical doctor to serve people. Please bless with this notable miracle soon and an opportunity to give my testimony for my son and my sacrificial thanksgiving! In case you interested God has given us basis cures for cancer. However the pill makers cover up the cures so they can make all the money. The rife machine and eating and m juicing all raw fruits and veggies has to cure cancer. Also, night hawk minerals have rocks that contain like a natural radioactivity that cures too. No, nothing magical. Like radioactivity it kills the bad but it doesn’t kill all the good with it so u are not effected the same way if you were using man made chemo. Of course , Pray is always a possitive good thing to do. I hope you do not mind me emailing you…I just want people to know the truth. May God bless you, your family and friends always. Amen. I pray that my son and daughter in law will have their prayers answered and will be holding a tiny infant in their arms in the near future. We are in a very special prayer group and would like to find a Shrine where we can all continue to meet and pray for people’s intentions in the world. Our Lady of Lourdes St. Bernadette Divine Mercy St Faustina Pope John Paul 11 and Maximilian Kolbe please hear and answer our prayers. Many thanks. I continue to pray for everyone who is suffering from illness may the Lord extend his hand over them and heal them spiritually and physically if it be his wish. Please pray for my sons especially my son JJ who is going through some trying times. God bless everyone. I pray not only for those afflicted with physical cancer, I pray for those infected with spiritual cancer; particularly the culture of death. Like St. Paul, may God in His infinite mercy bring them to holy conversion and heal the cancer dwelling in their souls. Continued prayers for my mother as she has just begun her chemo treatments. St Peregrine please pray for my family’s healing. Please pray also for the healing both in body and soul of everyone. Thank you St Peregrine for your prayers for those that have cancer. Please continue to pray for them and give them faith and hope as they go through this illness. Please pray for a young lady dying of breast cancer ,name is Rebecca and she is only 37 yrs old. Please God heal her . Let her feel your love. Thanks and God bless you all. Praying St. 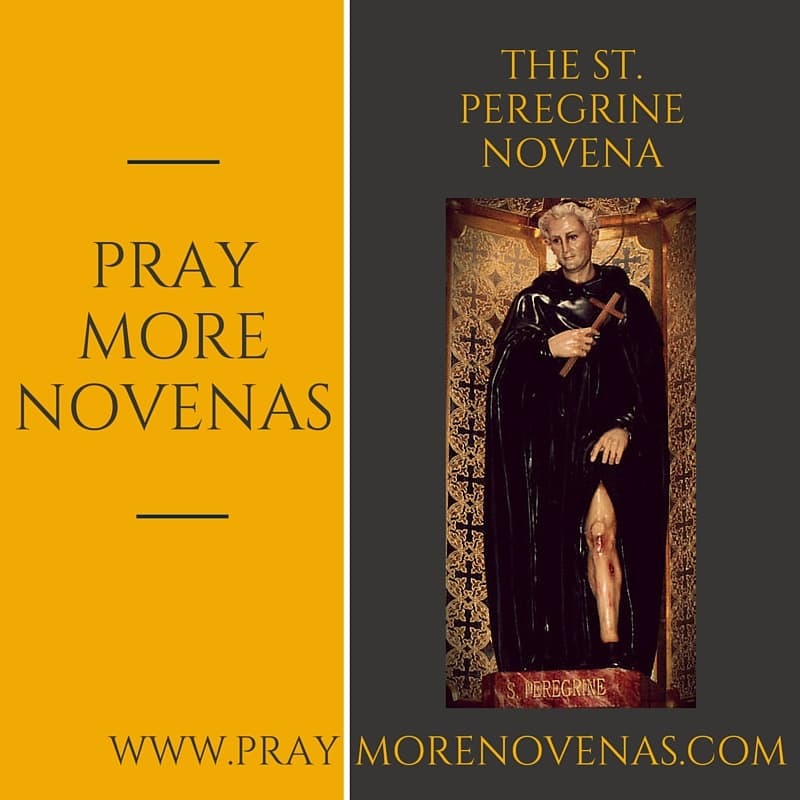 Peregrine intercede and all the angles and Saints please hear my prayers for my sister in Christ Jesus, Anne who is suffering from a cancer operation nearly three weeks ago. Make her stronger and stronger every day. Praying for her family to come to the Lord stronger than ever. I ask this in Jesus Holy name. Also, praying for all families suffering from physical sicknesses and mental illnesses. Amen ???? Thanksgiving for the blessings received through the intercession of St. Peregrine. I have had kidney cancer for 18 years. I began the novena with you. I had surgery to remove a malignant tumor on my femur on January 20. I was able to pray it every day. The surgery was very successful. They were able to remove all of it. I was home within 24 hours. I was filled with peace through the whole ordeal and overwhelmed by the grace of family and friends. Although my 81 year old mother doesn’t have cancer, I have been lifting her up in our nivenas. She was experiencing back pain and was told it was muscular. Meds did work so a CT scan was ordered. She has a small fracture on her lower back. I prayed we would get an answer to what was causing pain and we did. Thank you for St Peregrine’s miraculous healing for Graham , whose cousin a fellow congregant in my church asked for prayers in the week of 15 January as Graham had been overtaken with a serious attack with blood clots in his heart, complications with his heart and serious toxicity with his blood. He had been hospitalized, and I prayed the St Peregrine’s Novena for Graham’s healing as his Family had given up hope that he would live. On Sunday 22 Jan I met my fellow congregant, a cousin to Graham who had requested prayers for him & I was told that Graham had suddenly healed , his blood was OK but was still hospitalized as doctors were running tests further to ascertain what may resulted in his condition. Prayers for inner peace and feeling so alone, recently divorce and it has been very draining and depressed. Also a dear friend Aurora Hernandez Estrada, is very ill with Cancer, she is in lots of pain. those who are suffering with Cancer. Please help me recover my health and strength soon. In the name of the father. Thanking God for past prayers answered. Please continue to pray for my husband, that he be kept in God’s Holy Embrace… He is starting treatment soon for prostate cancer. Praying for all who are going through cancer treatment, healing for my son who suffered a heart attack, daughter’s diabetes, and stepson’s seizure disorder. You are a wonderous Lord! From his Cancers. Take away his Pain and give my sister Carolyn strength and health to deal with helping Alvin. St Peregrine, thru the grace of our Lord Jesus Christ I Come before you for your prayers for my sister in law Adele. She has been diagnosed with terminal bowel cancer which has spread. Please help us I prayer for her healing. She has started so much good work her on earth and she’s not done yet. Dear Jesus put your healing arms around her body. Keep evil away fro her take cancer away from her. We ask this in Jesus might name Amen. Pleas pray for Luz L.
Especially today on Her Birthday. test results every three months. Pl ease Lord don’t leave my daughter side in fighting cancer give her a second chance in life.